Yelena is a survivor. Kidnapped as a child, held prisoner as a teen, then released to act as a poison taster, she is now a student of magic. But these magic skills place her in imminent danger, and with an execution order on her head, she has no choice but to escape to Sitia, the land of birth. But nothing in Sitia is familiar. As she struggles to understand where she belongs and how to control her powers, a rogue magician emerges - and Yelena catches his eye. Suddenly she is embroiled in a situation not of her making. And once again her magical abilities will either save her life... or be her downfall. Once again Yelena finds herself in the middle of trouble. She travels to Sitia, not only to learn how to control her magic, but to meet her family - also, to escape Commander's killing order. It should have been an easy trip but nothing comes easy to Yelena. No only she finds she has a brother, Leif, who hates her but everyone thinks she is a spy. After everything Yelena already went through, I would like her to have a break. Even in those moments with Valek - yes, Yelena may be in Sitia, but our favorite spy master Valek finds a way to meet her -, she worries about him being found and discusses with him how to catch the rogue magician. In Magic Study, we met tons of new characters, but we also encounter older faces (Ari and Janco are back). On her way to the Citadel, she meets Cahil, the nephew of the dead Ixian King, who wants nothing more than his throne back. Their meeting was far from pleasurable. Cahil is one of those characters that makes you wonder who he truly is. Yelena's parents are adorable while Leif can be pretty hateful. However, at the end, I finally understood his cold and suspicious behavior. When Yelena reaches the Keep, the other three Magicians are revealed. Roze, the First Magician, is despicable and as soon as she meets Yelena it's her mission to make her life difficult. This woman, no matter how powerful she is, doesn't deserve to be First Magician. Being powerful with a rotten heart is a bad combination. In Magic Study, we have a look at the Sitian society which is very different from the Ixian society. Yelena has to learn how to live in this place and to control her magic before it's too late. The apprenticeship is over—now the real test has begun. When word that Yelena is a Soulfinder—able to capture and release souls—spreads like wildfire, people grow uneasy. Already Yelena's unusual abilities and past have set her apart. As the Council debates Yelena's fate, she receives a disturbing message: a plot is rising against her homeland, led by a murderous sorcerer she has defeated before... Honor sets Yelena on a path that will test the limits of her skills, and the hope of reuniting with her beloved spurs her onward. Her journey is fraught with allies, enemies, lovers and would-be assassins, each of questionable loyalty. Yelena will have but one chance to prove herself—and save the land she holds dear. As usual, Yelena finds herself in the worst situation possible - she isn't facing the noose, but some magicians want her dead. With the Sitian Council is after her, Yelena runs to Ixia. And, of course, Roze has tons of responsibility in Yelena's predicament because she can't accept who and what she is. No matter how difficult it is to accept, Yelena isn't an Ixian nor is she a Sitian. She belongs to both cultures - that's the reason she wanted to be the Liaison between both countries. Not only Yelena has to figure out what is wrong with the Council, but she is looking for the rogue magician who escaped from the Keep prison with Cahil's help. And all of this without knowing with whom she can trust apart from Valek. 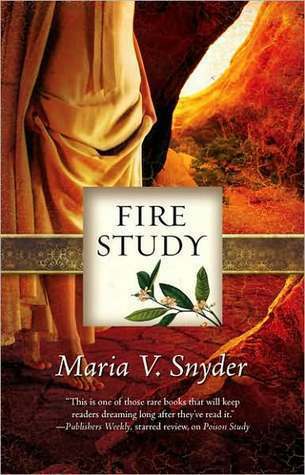 In Fire Study, Yelena struggles to accept that she is a Soulfinder. The last Soulfinder lived many years ago and all Yelena knows is that he was corrupted by his power. Due to those stories, she fights not to use her magic because of being afraid of it. I couldn't have asked for a better ending. No more loose strings. Yelena finally understands her magic - she decides if she wants to keep using it - and she finds her place in the world. Maria V. Snyder became one of my favorite writers and it's all because of the Study series. I can't wait to read Shadow Study - athough, I'm wondering if I should read her previous books before jumping into her last release. Booklover. Dreamer. Bookstagrammer. Gamer. Fangirl. TV series addicted. Fairytale lover. Funko and book collector. Welcome to my lovely secret. Bookish Kinda News 6. Jamily is Back!